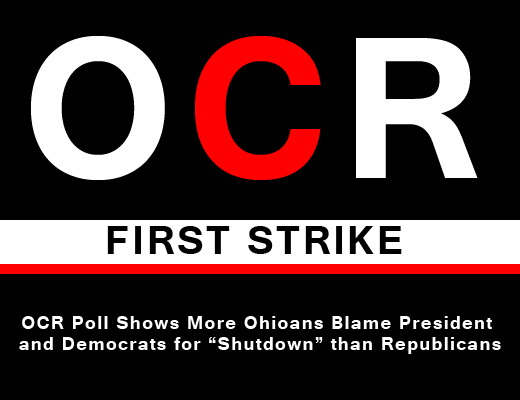 Columbus, Ohio – Today, the Ohio Conservative Review (www.OhioConservativeReview.com) conducted an automated telephone poll of 514 Ohioans, registered voters randomly selected from every Ohio county, which showed that more Ohioans blame President Obama and the Democratic Senate for the Government “shutdown” than blame Republicans by a margin of 35.03% to 33.66%. Equally significant, the poll found that 31.31% of Ohioans blamed both Democrats and Republicans for not working together. The survey then asked poll participants if they were aware from media reports that “Republican members of the US House have voted four times in the last week not to ‘shutdown’ the Government and that the Democratic Senate has voted to shut down the Government, one time simply to deny average Americans the same one year delay in Obamacare that the President has given to big business?” Over 35% of the poll participants said that they were not aware of the House votes to fund the Government from media reports. Participants were then asked “Does the fact that Republicans in the House have voted to fund all parts of Government, except Obamacare, affect who you blame for the so called Government shutdown?” When participants were provided with this new information, the blame shifted strongly toward the President and Democratic Senate with 42.89% saying they were to blame, while blame for House Republicans dropped to 31.55% and the number who blamed both dropped to 27.47%. 1 ) We are doing a poll of Ohio Voters about the current situation in Washington. Please press 5 to take this simple 5 question poll. If this message is on your answering machine, please call 877-308-3305 and enter poll ID 23 to take the poll. Again, the number to call is 877-308-3305. Thank you for taking our Poll. This poll is being conducted for the Ohio Conservative Review and the results will be published at www.OhioConservativeReview.com.